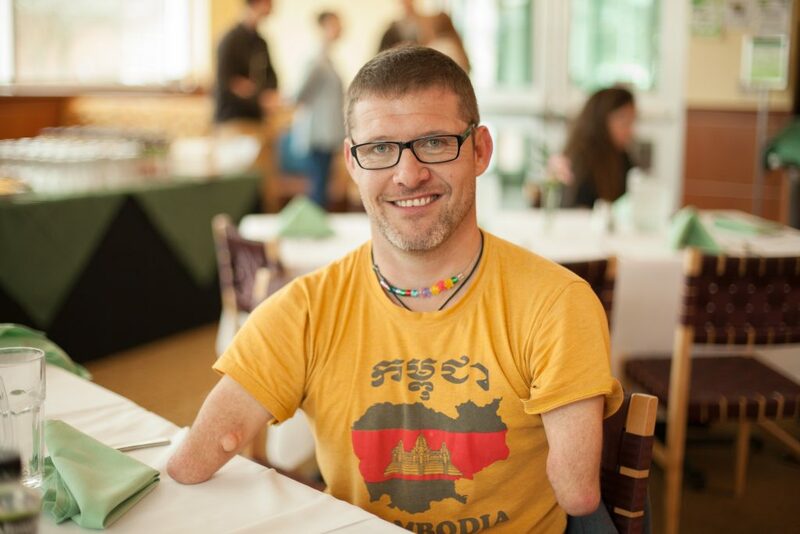 Pipe Dream sat down with Chris Koch, a motivational speaker who was born without arms and legs. He founded the “If I Can” organization and has traveled around the world sharing his experiences and message of resiliency. This interview has been edited for length and clarity. Pipe Dream: How did your experiences growing up shape the perspective that you currently have on life? PD: How did you start traveling and spreading your message? CK: It grew fairly organically, in that I’d always been asked to speak at local rotary clubs or local schools. I was involved with an organization in Canada called the War Amps Child Amputee Program, so I spoke at their stuff. Ever since I was in middle school, I was speaking. I was traveling, and I had more to talk about, and that was the springboard for the story that I tell now. It really took off and I started traveling and had more to talk about and have had some really cool experiences. About five or six years ago, I decided that I wanted to do this full time. I still work at home on the farm and try and help out as much as possible when we’re seeding and harvesting, but this is my bread and butter. PD: Do you have any highlights from your travels of people you’ve met or places you’ve been that particularly stand out to you? CK: Everywhere I’ve traveled to is special for me for a different reason. Nepal really sticks out as a pretty amazing place; the people there are incredibly kind and generous. Everywhere I’ve been, people are always so willing to help out. Even if I want to travel solo, I can’t because people are always jumping in to help me with a bag or something else. In my travels I’ve learned that 99.9 percent of the people that you encounter are going to be anywhere from good to absolutely incredible. I was never teased or bullied growing up as a kid and a lot of that is just confidence and the comfort in your own skin that you have. If you have that feeling on the inside, you can project it on the outside and people pick up on that. PD: Are there some things you still struggle with? CK: There are minor things, like dealing with light switches that are too high or having to do a little extra work to get to certain places. I’m sure there are ramps and stuff, but I don’t really feel like searching around trying to find them, so I’ll just do the stairs, which takes more energy. There are some days when I’m just in a funk and not feeling it and I think about how much easier life would be if I had arms and legs. I could just walk up to a bank machine, put my card in, punch the code, take my cash and be gone within 30 seconds. But I don’t have arms and legs. I’m never going to have arms and legs, so I can’t worry about stuff I have no control over. I have to get over it, snap myself back into it and realize that there are a lot of good things going on and concentrate on those instead of things you have no control over. PD: What are the main messages you want to impart on the people who come to hear you speak? CK: First and foremost, the whole ‘If I Can …’ — the name of my talk and my company and all that. If a guy without arms or legs can snowboard, surf, work on a farm and travel the world, anybody can do anything. It’s a mindset. The other thing I always tell people is that I’m more afraid of regret than I am of failure. At least try. Don’t look back on life saying, ‘I wish I would have done this.’ I look back on life knowing that I’ve done as much as I possibly could have and have had a lot of fun. There’s been some stuff that hasn’t gone my way, but at least I tried, so I’m not living with that regret. You learn a lot from your mistakes. You fall down and pick yourself up, dust yourself off, figure out what you need to do for yourself to prevent that from happening again and give it another go.